One of the victims jumped out of the seventh floor window. 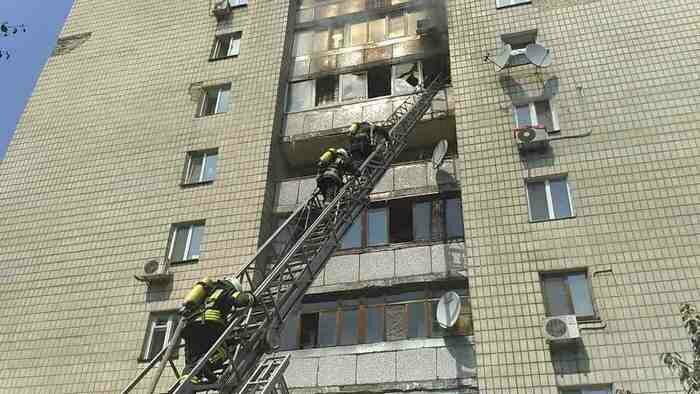 A fire at Kyiv's 10, Bekhterevskyy Lane on the morning of 11 August killed three people, the spokeswoman for the main directorate of the State Emergencies Service, Svitlana Vodolaha, has said on 112 Ukrayina TV. Vodolaha said that rescue units that arrived on the site five minutes after the emergency call found the body of a man who had jumped out of the seventh-floor window trying to escape from fire. The rescue crew for a long time could not enter the apartment because its doors were armoured. A metal fence surrounding the lawn beneath the apartment on fire also deterred the efforts of rescuers. "After extinguishing the fire, rescuers discovered the bodies of two more victims in the apartment," she said. According to unconfirmed reports, the owner of the apartment was a disabled woman who had three tenants. UPDATE. The city police later reported that the man who jumped out of the window first killed two women and then set the apartment on fire.